Chimpanzees playing the Ultimatum Game show a sense of fairness previously attributed only to humans. 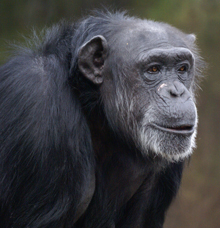 Researchers at the Yerkes National Primate Research Center, Emory University, are the first to show chimpanzees possess a sense of fairness that has previously been attributed as uniquely human. Working with colleagues from Georgia State University, the researchers played the Ultimatum Game with the chimpanzees to determine how sensitive the animals are to the reward distribution between two individuals if both need to agree on the outcome. According to first author Darby Proctor, "We used the Ultimatum Game because it is the gold standard to determine the human sense of fairness. In the game, one individual needs to propose a reward division to another individual and then have that individual accept the proposition before both can obtain the rewards. Humans typically offer generous portions, such as 50 percent of the reward, to their partners, and that's exactly what we recorded in our study with chimpanzees." Co-author Frans de Waal adds, "Until our study, the behavioral economics community assumed the Ultimatum Game could not be played with animals or that animals would choose only the most selfish option while playing. We've concluded that chimpanzees not only get very close to the human sense of fairness, but the animals may actually have exactly the same preferences as our own species." For purposes of direct comparison, the study was also conducted separately with human children. Chimpanzees, who are highly cooperative in the wild, likely need to be sensitive to reward distributions in order to reap the benefits of cooperation. Thus, this study opens the door for further explorations into the mechanisms behind this human-like behavior. For eight decades, the Yerkes National Primate Research Center has been dedicated to conducting essential basic science and translational research to advance scientific understanding and to improve the health and well-being of humans and nonhuman primates. Today, the center, as one of only eight National Institutes of Health–funded national primate research centers, provides leadership, training and resources to foster scientific creativity, collaboration and discoveries. Yerkes-based research is grounded in scientific integrity, expert knowledge, respect for colleagues, an open exchange of ideas and compassionate quality animal care.